Police, prosecutors,and medical professionals gathered in Iowa City this week for a summit on the growing problem of heroin addiction in Iowa. They heard how overuse of prescription painkillers leads addicts to turn to heroin — which is cheaper and easier to get — and how heroin use now rivals the methamphetamine epidemic. Doctor Anthony Miller with Veterans Hospital in Iowa City says the heroin problem has its roots in the 1990’s when views on managing pain shifted in American medicine. He says providers began to think that undertreating pain was wrong, and that pain killers known as opioids are safe. “And between the years of 1997 and 2007 the amount of opioids prescribed in the United States quadrupled,” Millers says. Their use in Iowa tripled and the addiction to opioids soared. Now addicts who started on pain pills are injecting heroin to satisfy the craving. Heroin deaths which we used to be associated with a sordid ghetto life are happening to the boy and girl next door. Andy Brown of Davenport was prescribed Percocet for pain after surgery when he was 14. He died of heroin overdose at the age of 33. His mother, Kim Brown showed pictures of her son during the summit and says . overdosed three times in all. “The third time he overdosed he died,” Brown says. ” The person he was with didn’t call for help.” Brown now advocates for easier access to a medicine that works as an antidote for an overdose that would otherwise be deadly. That’s one of several strategies experts examined to minimize the damage from heroin use, while law enforcement struggles to keep it off the streets. Federal Drug Enforcement Agent Matt Bradford says big heroin busts are going down in Chicago and that is a key here. “Chicago is your main source city that supplies Iowa. So, Chicago is important,” according to Bradford. He says the drug comes primarily from a cartel in Mexico. Now officials have launched the Eastern Iowa Heroin Initiative to address prevention, treatment and enforcement in Linn, Johnson, Blackhawk and Dubuque Counties. Jerrry Blomgren with the Johnson County Narcotics Task Force attended the summit with several of his undercover cops. “A lot of them do undercover buys of drugs. Heroin has been a big problem for all of us,” Blomgren says. A spokesman for the Iowa Department of Public Health says there are more methodone clinics to treat the addicted in eastern Iowa because of the heroin problem there. He says there are clinics in Council Bluffs and Sioux City in western Iowa and that doesn’t leave a lot of options when patients there are coming for daily dosing. While heroin has grabbed the attention of Iowans the relatively older problem of painkiller addiction persists. Experts say student athletes should be educated about pain meds. 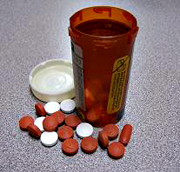 They say employers should be aware of the potential for their employees to be overprescribed pain meds following workplace injuries. Keynote speaker Sam Quinones, author of “Dreamland: The True Tale of America’s Opiate Epidemic.” says pharmaceutical companies should be paying for the unused drug collection efforts underway in some Iowa towns. He says heroin use has exploded because it hasn’t been acknowledged like meth. “People have been mortified to talk about their kid — who died in a McDonald’s bathroom with a needle in his arm,” Quinones says. Kim Brown knows that frustration firsthand. “Because when my son died in 2011, I didn’t have anywhere to go….nobody would talk to me,” Brown explains. Brown now heads up a group for parents who’ve lost children to drug overdose. She’ll be back will at the capitol next year pushing for a law to let families have the antidote that stops a heroin overdose. She says that might have saved her son’s life. Health officials say for the 13-year period beginning in 2000, Iowans dying from prescription medication overdoses increased 20-fold. Heroin overdose deaths experienced the same alarming rate of increase, jumping from one to 20 deaths per year. Thanks to Joyce Russell Iowa Pubic Radio.